Add student101 to the "Quiz override group" group. Add a group override for the "Quiz override group" for the "Open date in the past (1 Jan 2018). Close in the future (31 Dec 2018)" quiz setting the enddate to january 1st 2019. 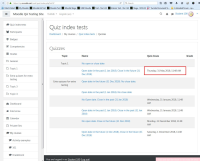 Access the Quiz index page(mod/quiz/index) as student100. Cross-check it shows 31 Dec 2018. Enable the display of Notices by setting Site Administration → Development → Debugging → Debug messages to "DEVELOPER: extra Moodle debug messages for developers"
Add a user override for the "Student 101" user for the "No open date. Close in the future (31 Dec 2018)" quiz setting the enddate to january 1st 2019. Plus: do check Garry's use cases. Where there isn't a close date - Fail - Nothing is displayed instead of 'No close date' – FIX: 'No close date' is displayed. Where there isn't a close date - Fail - No date displays instead of 'No close date' – FIX: 'No close date' is displayed. 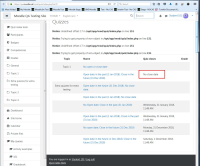 Where there is a close date - Fail - Displays 'No close date' instead of default date – FIX: default date is displayed. Where there is a close date - Fail - Override date displays instead of default date – FIX: default date is displayed. Import the attached course. Add student101 to the "Quiz override group" group. Add a group override for the "Quiz override group" for the "Open date in the past (1 Jan 2018). Close in the future (31 Dec 2018)" quiz setting the enddate to january 1st 2019. Access the Quiz index page(mod/quiz/index) as student100. Cross-check it shows 31 Dec 2018. Enable the display of Notices by setting Site Administration → Development → Debugging → Debug messages to "DEVELOPER: extra Moodle debug messages for developers" Import the course. Add a user override for the "Student 101" user for the "No open date. Close in the future (31 Dec 2018)" quiz setting the enddate to january 1st 2019. Access the Quiz index page(mod/quiz/index) as student100. Cross-check it shows no notice Plus: do check Garry's use cases. My results No overrides Where there isn't a close date - Fail - Nothing is displayed instead of 'No close date' – FIX: 'No close date' is displayed. Where there is a close date - Pass - The correct date displays With a user override User with the override: Where there isn't a close date - Fail - No date displays instead of 'No close date' – FIX: 'No close date' is displayed. Where there is a close date - Pass - Displays the override date Users without overrides: Where there isn't a close date - Fail - No date displays instead of 'No close date' – FIX: 'No close date' is displayed. Where there is a close date - Fail - Displays 'No close date' instead of default date – FIX: default date is displayed. With a group override User in a group with override: Where there isn't a close date - Fail - No date displays instead of 'No close date' – FIX: 'No close date' is displayed. Where there is a close date - Pass - Override date displays Users without overrides: Where there isn't a close date - Fail - No date displays instead of 'No close date' – FIX: 'No close date' is displayed. Where there is a close date - Fail - Override date displays instead of default date – FIX: default date is displayed. 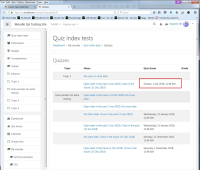 The quiz page (mod/quiz/index) accessed from Activities > Quiz incorrectly display "No close date" when it has one or a the incorrect date when user and group overrides are used. The incorrect information is displayed for those students that don't have an override. We have students miss close dates as they have seen 'No close date' displayed on this page when there are close dates. The quiz dates in other areas I have tested are correct. It is just this page that has the issues. View the Activities > Quiz page for each of the students. Do further testing to cover the scenarios above. Access the Quiz index page(mod/quiz/index) as student100 which should not be affected by the override to experience the lastmost mentioned example above.